I use this machine for gaming and content creation. It works pretty well, stays fairly cool. It plays all my games at my desired settings at a buttery smooth 60+ fps. I will be upgrading it eventually with 16 GB of Ram, though. And maybe an i7. After using this computer for about a week now, here's what I have to say: This PC is fairly well optimized in terms of price to performance. At $780 (without the microphone and sound card which are not necessary), this computer can handle basic 1080p video editing, has decent rendering times, can handle multitasking quite well, and plays most games at 1080p and high settings or better and achieve 60 fps. For example, The Crew runs at 60 fps on Ultra settings, Space Engineers runs around 50 (but I want my graphics settings on high, so if you turn down something, 60 is easily achievable), Minecraft (1.11.2 with KUDA Shader Pack and Optifine) runs at 55-60 fps with all settings maxed, depending upon the world type (amplified worlds run around 25-30). Keep in mind that I DID overclock the RX 470 from 1230 MHz to 1385 MHz, and boosted the RAM from 1600 MHz to 1950 MHz for an effective memory speed of 7.8 GHz! The only limitation this PC has (if you're a content creator on a budget) is RAM. 8GB is barely enough to play games and record them simultaneously with a Chrome tab (or something else) open. I strongly suggest getting a 16 GB kit if you plan on making YouTube videos with this machine. I will be upgrading to 16 GB very soon. If you just want to play games, this machine is almost perfect as it is. Just buy an exhaust fan and you're good to go. If you're worried about noise with the stock cooler, and the case fan, don't be! I used SpeedFan to control my fan speeds and I let them go as slow as they will while I do basic tasks like browsing the web. The loudest part in my computer is actually the hard drive, while the fans are running this slowly. The HDD trays in this case are not padded or anything, so any vibrations made by the hard drive do get slightly amplified by the case, so there's that. For it's price, it's a decent CPU. Smooth 1080p video editing, and great gaming performance when paired with an appropriate GPU. I've had no problems with this CPU, but I recommend getting a faster i5, like a 6600k. In summary, it's pretty good. I like it. This motherboard looks pretty nice, has basic overclocking functionality, M.2 SSD support, etc. If you're reading reviews, you probably read the specs, so I won't go over those. The BIOS is at first a little bit confusing at first, but it doesn't take long to learn how to navigate. As a first time builder, the "Click BIOS" was a pretty neat feature, but I didn't really use my mouse. I prefer the keyboard for that. This board looks really nice, reinforced PCI-E slots give peace of mind, even though my graphics card is fairly light. The fan slots are a little bit... oddly placed, but if you route the cables right, you won't notice them. This is a fairly fast graphics card and I really like it. I managed to get mine to go 1385 MHz on the core, and 1950 MHz on the memory. 5/5 for great overclocking, great performance, good looks, and good price. Edit: Do NOT buy this card for more than $200. This came about because I noticed the price tag on this card going higher than $170 all the way up to $299 then $399. It's not worth it. This is a decent case. It looks fairly good, and I'm proud to have this sitting on my desk; however, the cable management is not very good. It barely fits my cables and all I have is the 24 pin Motherboard connector, 8 pin CPU power, 2 SATA power and data cables, and the PCI-E power connectors. Basic gaming computer cables. I had a hard time getting the side panel on despite my best efforts to neatly arrange the cables. It does fit everything, though, and there is no bulge on the side panel. The fan is fairly quiet at 100%, despite what others say, and it looks good. 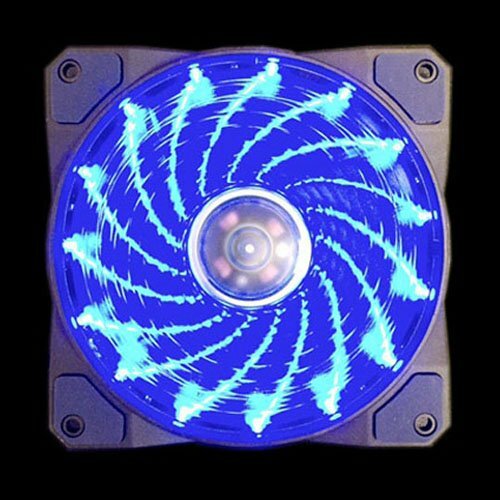 It moves a decent amount of air at 40-50% fan speed, and a LOT of air at 100%. I recommend this case for budget builders, but keep in mind you'll have to work harder on cable management. Edit: I tried to remove the front panel with my optical drive in... I learned that you MUST remove any and all 5 1/4 inch drives/fan controllers before you can remove the front panel. VERY quiet power supply, all black cables, and supplies more than enough wattage for the parts I have. 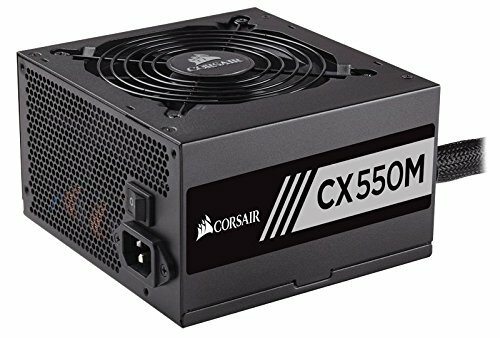 I probably won't change the PSU in my build for years. Very good, runs cool, and I can't even hear it. Nice build! For now, I'd only suggest tidying up your cable management, and you'll be set! You might want to invest in a small SSD (120-240GB) for use as a boot drive as a next upgrade, which will speed up your boot times and basic system processes by huge numbers, and give you a much better experience on usability than immediately upgrading to an i7. Thanks! The cable management is about as good as I can get it in this case. The power supply only comes with one 8 pin (coming off the psu) to 2 6+2 pin PCI-E power connectors (into gpu(s)). I can't hide them, but I can keep them in check. 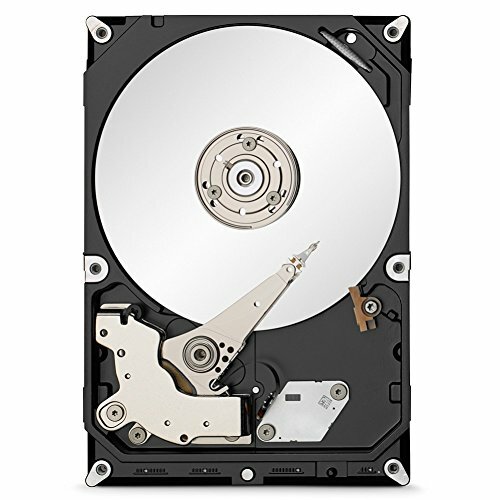 I was thinking about utilizing the M.2 slot on my motherboard for a 120 GB SSD to move my OS to and a couple of games to, but I don't know how to do that. The i7 is only really to help with content creation as that was the original goal of this machine: game commentary videos. Also, the clock speed on any 6th gen desktop i7 is much higher than this i5 6400. If I was only using this for gaming, the i7 wouldn't even be a thought. Also, the first thing I'm upgrading on this is case cooling fans. I need more of those. I had to ziptie an old CPU fan to the top of my case to exhaust that hot air. Got it -- I myself probably would have gone with a 6600K from the outset and overclocked for the clock speed I need, but an upgrade to an i7 makes sense for you then -- the extra threads will definitely help. Shouldn't be too tough of a job to move your OS over to a new m.2 -- searching "how to move os to ssd" yielded plenty of results, and it shouldn't be more than physically moving your files over and tweaking a few BIOS settings. I would have as well, but I literally could not afford that processor, a Z-170 board, and a good cooler. That seems a lot simpler than I thought. Of course, but it also might be a more expensive upgrade later depending on part prices than having made the initial investment. Seems like it'd be pretty close to the same price though in your case, so if the money works out for you now and later, then it's great. Linus has a couple in-depth videos on it if you like his content, and other smaller channels have plenty of tutorials as well. Did you overclock that RX 470 via WattMan or MSI afterburner? I have the same exact GPU in another build of mine, I have been trying to overclock the card also. MSI Afterburner. I don't know how to use WattMan, and I don't exactly have time to tinker with it. Ah ok I used Wattman, its not much different, just when you adjust the core clock, you have to adjust it in 7 states. BTW, when you use afterburner, do you have to leave it open to keep the overclocking applied. PSS... Did you change the fan speeds or leave it to automatic. Ah ok. No, you don't have to leave it open. Just hit the checkmark, and your OC is applied and won't change until you restart the system, or if you click "Apply at Startup" it will only change if you OC too far and it crashes, or you uninstall Afterburner. This happened to me dozens of times while I was testing my OC. I tried setting up a custom fan curve, but because of how warm it idles, it caused the fans to scream, trying to get it under 50 C. So yes, I left it at auto. Yeah, I just changed it in Wattman. and my computer said **** you, I ain't lettin' you overclock. Did you have any crashes after overclocking also? I had to turn it down a little bit to 1375 because WattMan was like "130 watts is too much!!" OK, yeah 130 is a lot for a board designed to take 120, but still. Yes, it crashed. Once, I OC'd WAAAAYY too far and Windows actually crashed. I had to boot into Safe Mode, uninstall Afterburner, restart, and reinstall. It's crashed lots of times. Part of it is the insane memory speed, part of it is clock speed, part is too much wattage. How is your cpu at 3.9ghz? 3.09 GHz. Not 3.9. I'd love to see it run that fast, though. Oh okay, but doesn't that go over 2.7ghz that's the stock speed of the 6400? Yes, the stock speed is 2.7, but it boosts to 3.3. I locked it in the BIOS to 3.09. I wanted to make it stay at 3.3, but my BIOS said "NO that's not allowed."